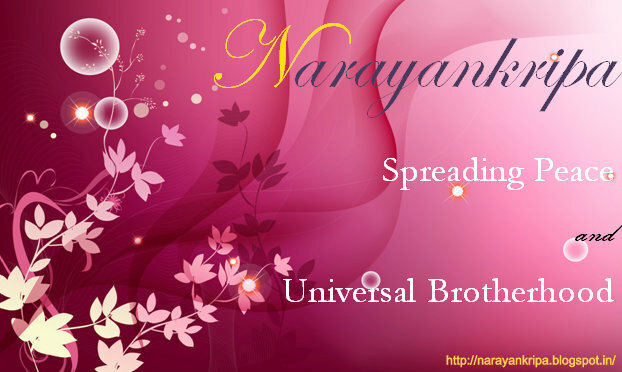 Today, Narayankripa has completed three years of spreading peace and universal brotherhood in the blogging form. Narayankripa - Gurukripa is eternal, it's always expressed and experienced in different forms. I am blessed to be the author of Narayankripa in blogging form. These three years have changed my life, it has meaning and a purpose. Whenever I think about problems in my life, I get tense, but when I again work on the mission of spreading peace, when I write peaceful poems, I forget the small tensions of life. What I have realized in past three years is when we think for the mankind, think for our planet our heart is purified. When we contribute towards world peace by words of poems, by actions, by simply spreading the brotherhood and by spreading Mahayoga we are actually performing a Sadhana, reaching the Moksha - Jeevanmukti with purification of thoughts, goals and actions. It is not necessary to change the world and I can't do that, but by contributing some moments by blessedness to the world, some words - thoughts of kindness change the world around me. Narayankripa has made my world beautiful, peaceful and blessed. And it's because you all are with me to support encourage and experience and work together for the mission of spreading the peace. Mahayoga is the path of inner purification and self realization. When people get freedom from the conflicts of mind - Freedom from Cage of thoughts- they contribute towards world peace, because the violence, wars, hatred are the larger manifestation of conflicts in human mind. So, spreading the peace by spreading Mahayoga, and by spreading Advaita is a Yajnya for the peace of the planet. On this beautiful - golden day of celebration of anniversary of Narayankripa, sharing the most divine words of my Sadgurudeva H. H. Shri Narayankaka Dhekane Maharaj. This video is of Third International Yoga Seminar Oct 2012. Gurudeva's health was not well at that time, still for spreading the Mahayoga message and conducting the workshop he traveled and enlightened the people with his divine speech. When he told people to close eyes and observe Mahayoga introductory practice, people were almost in trance. When the workshop was over and people were told to open the eyes still they couldn't do so as their minds were deep immersed and melt in the Prana. "May Sadgurudeva give me the strength and Gyana to spread the Mahayoga for the whole life." It's not possible to reach - not even to look at the height He has lived and spread the Mahayoga work, but I am sure, by His Blessings - By Narayankripa this mission of blog will also become eternal. Another form of Narayankripa - blessings of my Gurudeva is 'You' - the readers, the friends who are always with me. I meet the Bhagwan when I meet all of you and I will never thank Bhagwanji. I can only do Pranama - I bow to all of you. I am here, because of all of you. My dearest sisters Arti, Geeta, Simran, Melissa are always with me in the happy, sad, anxious moments of life, giving me strength and courage to fight with the problems. How can I thank you for your unconditional love! I miss my dearest friend Sancheeta, who would be happiest to celebrate this day, though you have left this world but you are always present in our hearts. No words to thank the a true friends like Monu, Lekhraj. It's a blessing to have true friends and guides - well wishers like Shri. Umesh Derebailji, Shri Pramod Lohiyaji, Shri Vinayak Ranadeji, Shri. Irfanuddinji and Animesh. From the beginning of blogging, when I didn't know much about intellectual property rights, technical knowledge, my friend Kanchan Karai has always helped me. You are not just a friend, you are always inspiring, you are a leader, your fight against injustice is inspiring to all of us. I can never say thanks to you. Behind all the work and success of my blogging, my silent brothers are always here to help me. Govind, Deepak, Shripad Dada, Dnyanesh Dada you are best brothers of the world. I don't think I could manage all the blogs and life too without you. One blessing of life is meeting Sau. Jayashree Kaku on Facebook. Jayashree kakau is always inspiring and guiding. Your restless work has given the Sanskaras in my life, just like my Granny did for me. I wish sweet sweet love and blessings be always with me. Also my Facebook friends and sisters Umaji, Reshmi, Aditi are the motivator to me..:). Your friendship is priceless. To get the opportunity to work with Akhil Bharat Hindu Mahasabha is blessed part of life. Guidance of Shri. Pramod Pandit Joshiji and all my activists friends has made my thoughts and vision more perfect and comprehensive. I wish, to be always blessed by such great guidance and great experience to work for the country. Walking on spiritual path is very difficult and that too at the young age. Most of the times spiritual thoughts are opposed and many people leave their desire to grow spiritually. But every moment of my life is blessed by Narayankripa so I have spiritual friends like Ms Seema Sharmaji, Pramod Kumar. The spiritual knowledge, thoughts you share are the precious divine pearls of my life. Because of blogging and social networking, I met my Mahayoga Sadhak Bandhus also. Meeting Sadhakas and Gurubandhus (Disciples from same Guru lineage)and discussing, learning from them is a part of divine experiences of spiritual progress. In this journey, I have met Shri. Shrikrishna Puranik Kaka, who is also Mahayoga Sadhak. Your guidance, help and precious spiritual thoughts are beyond words. It's the Sadgurukripa that I have met Senior Sadhaka like you. The Sadhana paths may be different but the feeling of Sadhana, Gurukripa is the same. ISKON Senior Sadhaka Shri. Ramesh Shuklaji has always encouraged my small contribution in writing spiritual articles and poetry. This encouragement and the spiritual thoughts which you share has made my thoughts more mature and you have always inspired me to serve for humanity and mankind. I don't from where to find the words to express my feelings about the support and encouragement Shri Narayanan Venkatakrishnan Sir have given to my poems. To write my feelings here, I have stopped from ten minutes but failed to express, that's what I can tell honestly. Gurudeva has always emphasized on GuruTattva - not the name and material form of being Guru. He has said, this Gurutattva is really great. Yes, it comes in different forms and enlightens the disciple in different ways, words, books and the experiences which we can't even imagine. When my Sadgurudeva left earthly body, I was in the illusion that he has left us. I forgot His message about Gurutattva. I thought, I can't live for a single moment now. That time, Pujya Shri. Kalki Sharma Guruji told me the meaning of Videha Mukti and I came out of my mad thoughts of illusion. This incidence and many such teachings by Kalki Guruji have made me realize the words of Gurudeva again and again. Here again I don't know, what to say, how to do Pranama. But I think, what I wish to express is conveyed. At this emotional point, it's difficult to write more, if I miss the name of any of my friends in this story, that's only because missing the name - not forgetting the friend. All my friends are forms of Bhagwan and I can never ever forget you...:). Happy Third Birthday for your Blog Mohini!!! Keep Smiling! !